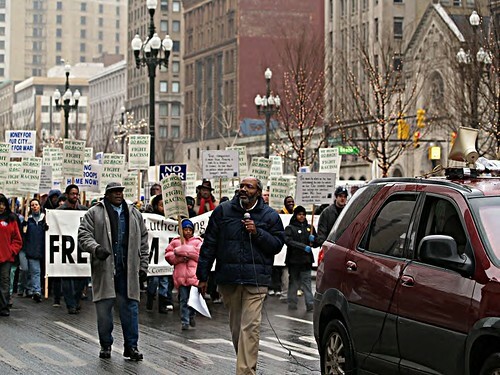 Abayomi Azikiwe, editor of the Pan-African News Wire, holding microphone at Detroit MLK Day March on Washington Blvd. downtown, January 15, 2007. (Photo: Robert Akrawi)., a photo by Pan-African News Wire File Photos on Flickr. This year's commemorative celebration of the federal holiday honoring the late Dr. Martin Luther King, Jr. on his 85th birthday will again take place at Central United Methodist Church, located on Woodward Avenue and East Adams, downtown, on Jan. 20 beginning at Noon. There will be a rally and a march through downtown Detroit returning to the Church for a community meal and cultural program. The theme of the 2014 event is "Honoring the Legacy of Freedom Summer of 1964 and Lessons for Today." Special tributes will be paid to the historic and courageous work of Mrs. Fannie Lou Hamer of Sunflower County, Mississippi who was a leading member of the Mississippi Freedom Democratic Party (MFDP) and the Student Nonviolent Coordinating Committee (SNCC) which challenged the seating of the all-white Democratic Party delegation at the national convention in Atlantic City, NJ that summer. During the summer of 1964 nearly one thousand mainly young people traveled into the most dangerous areas of Mississippi and Southwest Tennessee to assist with the ongoing registration of African Americans to vote and to fight American-apartheid. Even though the Civil Rights Act of 1964 was passed that summer, the activists loss three heroic fighters: Andrew Goodman, James Cheney and Michael Schwerner, who were brutally lynched by Mississippi law-enforcement officers and the Ku Klux Klan. Hundreds of others were subjected to arbitrary arrests and beatings. Also that same year, Malcolm X traveled to Africa, the Middle East and Europe on behalf of the Muslim Mosque, Inc. and the Organization of Afro-American Unity (OAAU) seeking to internationalize the Black freedom struggle in the United States. Malcolm would present an eight-page memorandum to the Organization of African Unity (OAU) second annual summit in Cairo, Egypt calling for an alliance between African Americans and African governments to eliminate racism and colonialism in their respective regions of the world. The public is cordially invited to attend this 11th annual Detroit MLK Day event featuring Bobbi Thompson & The Deep River Choir, the Detroit School of Arts Acappella Group, "Vision." Special speakers will include recently-retired City Councilwoman JoAnn Watson; Retired-Judge Claudia Morcom, National Lawyers Guild Southern Regional Coordinator during Freedom Summer; Edith Lee Payne, a participants in the 1963 Great Walk to Freedom in Detroit and the March on Washington; Cynthia Blair, Detroit activist with the Stop the Theft of Our Pensions Committee (STOPC); Michael Reynolds of the Michigan Coalition for Human Rights (MCHR) 2013 Freedom Tour, among others. This event is organized by the Detroit MLK Day Committee and supported by the leading community organizations throughout the metropolitan area. For those who would like to support the annual commemoration please send donations to: The Detroit MLK Committee, 5920 Second Ave., Detroit , MI, 48202. You may also donate online at our website: http://mlkdetroit.org .